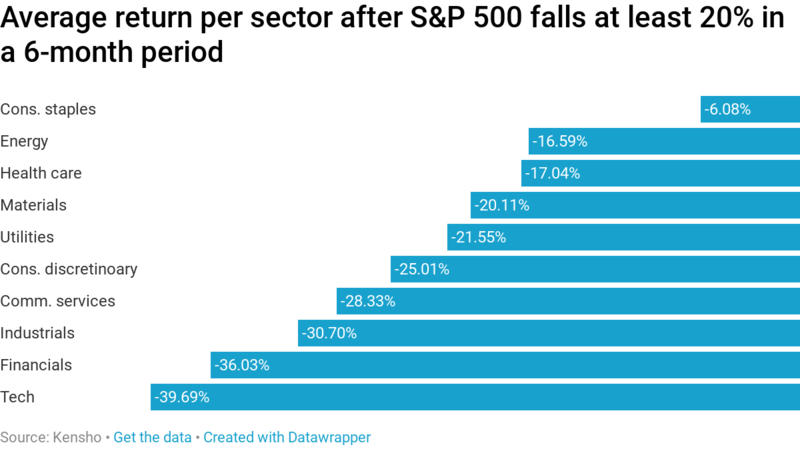 A CNBC analysis using Kensho found that all 11 S&P 500 sectors average steep losses after the broad index plunges 20 percent or more in a six-month period. The analysis also shows 10 of those sectors average losses of at least 16 percent. The financials, technology and industrials sectors all average losses of at least 30 percent when this happens. The consumer staples sector is the relative outperformer during these sell-offs, averaging a decline of 6.08 percent. Investors will have a hard time finding a place to hide should the S&P 500 keep trading in bear market territory, if history is any indication. A CNBC analysis using Kensho found that all 11 S&P 500 sectors average steep losses after the broad index plunges 20 percent or more in a six-month period. The analysis also shows 10 of those sectors average losses of at least 16 percent. The financials, technology and industrials sectors all average losses of at least 30 percent in the six months after the S&P 500's drop. The consumer staples sector is the relative outperformer during these sell-offs, averaging a decline of 6.08 percent. The S&P 500 entered Wednesday's session in a bear market, down 20.06 percent from an all-time intraday high set on Sept. 21 amid ongoing turmoil in Washington. Stocks entered bear market territory on Monday after the worst Christmas Eve sell-off in history. President Donald Trump went after the Federal Reserve once again on Monday, calling it "the only problem our economy has" in a tweet. Trump also said the central bank does not "have a feel for the Market." Multiple reports also surfaced last week claiming Trump was considering firing Fed Chairman Jerome Powell. Trump's tweet and the reports of Powell's possible firing came as several parts of the federal government shut down over funding for a wall along the U.S.-Mexico border. The Trump administration says the wall is crucial to national security while opponents of the barrier claim it will not solve the country's immigration problems. Meanwhile, Treasury Secretary Steven Mnuchin held calls with the leaders of the six largest U.S. banks in an attempt to reassure investors that the economy and financial markets were in good shape. This failed to quell investor fears, however, as the S&P 500 dropped 2.7 percent Monday.